I just read an article in today’s Wall Street Journal by Aneel Karnani, associate professor of strategy at the University of Michigan’s Stephen M. Ross School of Business. Before I finished the second paragraph, I knew it needed a rebuttal from the REACH Blog. Our loyal readers (thanks, Mom) know that REACH is focused on two things – helping our clients and helping people in need. We think helping others is kind-of a good thing to do. We do it at home. We do it at church. And we just figure why not do it at work too? But the professor from Michigan has different ideas. 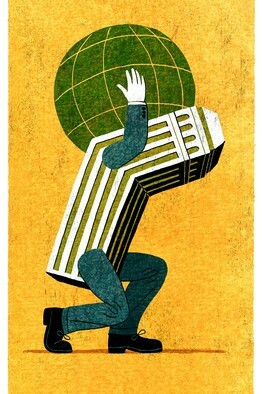 He has in mind huge global corporations where corporate citizenship is much more politically tricky. With so many people involved – shareholders, employees, customers, public opinion – what’s a company to do? Too much of the greater good could endanger profits and sour shareholders. Too little could drive away socially-responsible customers and employees. Plus there’s the question of how. Should Starbucks support fair trade or clean water? Which is more important? Which is more urgent? It’s impossible to please everyone. I’ve chosen the most egregious sections of the column to rebut, but out of fairness, I encourage you to read his entire article because not all his points are as ill-conceived as those highlighted below. Granted, the professor is weighing the merits of models rather than individuals. He’s thinking macro. Global economics. But some of his points are poorly-presented or just plain wrong. So much so that it’s hard to parse what of the macro-level logic carries weight. “So now what? Should executives in these situations heed the call for corporate social responsibility even without the allure of profiting from it? You can argue that they should. But you shouldn’t expect that they will. This point would make perfect sense if we assume that “profit as the top priority” is the mantra of every company on Earth. I think that’s assuming too much, partly because I know several companies who aspire to greater goals. What if a corporation and all its shareholders (it might help to imagine a smaller company) agree that their highest goal is not profit? What if a group of shareholders, in fact, hired and promoted executives because they chose not to sacrifice social welfare for the sake of money? What if a company did expect more of its executives? What if a company wanted a CEO who would lead them well into something richer than cash? Those companies exist. Let’s hold them up as shining examples rather than unrealistic expectations. I have two observations about this paragraph. 1. If Professor Karnani isn’t used to submitting to this kind of arrangement, he really should join the majority of Americans in supporting a charity. This is exactly what happens with almost every nonprofit organization in the world. Supporters agree to live with less, and trust leaders of their chosen charities to make decisions about how to spend their donations. It really is a freeing thing to give away money. The professor should try it. 2. I understand from this paragraph that the professor sees it as the government’s role to impose taxes and then arbitrarily decide how the money should be spent. That approach turns democracy and capitalism exactly backwards. Of all organizations on the planet, government is the one that should be allowed the least autonomy in “arbitrarily deciding how money should be spent” for two very obvious reasons: A. Elected officials are exposed to less risk than corporate leaders (before you protest, professor, consider your point from the preceding paragraph about the tenuousness of executive tenure), and B. Elected officials have done nothing to help earn the money they’re spending. I’m a regular reader of the Wall Street Journal and as a former newspaperman myself, I appreciate the paper’s continued success amid troubling times for journalism. I can even applaud their commitment to present a wide range viewpoints. Unfortunately, I think they might have done well in this case to find a viewpoint that made more sense. PS: I know it’s pretty easy for me to take pot-shots at Professor Karnani when there is little chance he’ll ever read this. So I’ve emailed a copy of this essay and a link to this blog to the contact information listed for him at the bottom of his article and on the University of Michigan website. A client recently asked us to “create something really viral.” We declined. If there was a formula for creating viral video, we would certainly offer it to our clients. There isn’t. Ask Nationwide Insurance or Jack In the Box or any of a hundred other companies who have made obvious attempts to create the next viral video. You can’t orchestrate viral. Neither should you judge content by the extent to which it “goes viral”. A marketing colleague was reviewing TV spots with me last month and disagreed that this year’s version of a certain campaign was better than last year’s. He said, “Creatively, you’re right. But the number of copycat videos on YouTube from last year’s version is staggering. Very viral.” I hope YouTube spoofs have not become the measure of an ad campaign. But if there ever was a best practice for creating viral buzz, Portland-based Wieden + Kennedy found it with the Old Spice Guy web video campaign. That project, which included dozens of creatives hunkered down in a studio round the clock producing and posting videos at the rate of one every seven minutes, has become the touchstone of successful social media campaigns. To read all the behind-the-scenes details about how they pulled it off, go here. The other brilliant element to that campaign was its price tag. While it certainly cost a bundle to set up the video-making “war room”, hire the right talent, etc. those costs are minuscule compared to national TV campaigns, pro sports sponsorships, and other avenues traditionally used to peddle mens’ hygiene products. And that from a company who has plenty to spend. Proctor & Gamble consistently competes with General Motors for the largest ad budget in the nation. While REACH (or your current ad agency) probably won’t have the desire or the resources to illuminate the next Old Spice Guy, there is something about those viral videos that REACH can offer – value. Videos (or images or forwarded emails or any other content) that go viral do so because they have some intrinsic value – something about them that is beautiful or funny or poignant. Agencies love to create that stuff. We dream of clients who will ask us to “create something really beautiful”. A lot of times the company brand or message gets in the way, but occasionally we get to work on a project that carries the marketing message AND some intrinsic value. Those are the sweet spots. That’s what we love to do, whether it goes viral or not.